PARIS: A signal from the Universe’s first stars, born a cosmic heartbeat after the Big Bang, has been detected for the first time, astronomers said Wednesday, setting the science world aflutter. The observation came after a decade-long quest, years earlier than expected, and was described by one excited observer as the biggest astronomical breakthrough since the Nobel-capped detection of gravitational waves in 2015. The findings have to be confirmed by other experiments. Crucially, it is hoped the discovery will shed light on dark matter — an invisible, mysterious substance thought to make up a large share of the Universe. “Finding this miniscule signal has opened a new window on the early Universe,” said Arizona State University astronomer Judd Bowman, the project’s lead investigator. Fingerprints of the stars, already active 13.6 billion years ago — a mere 180 million years after the Big Bang gave rise to the Universe — were picked up by a dining table-sized radio spectrometer in the Australian desert. Such evidence had been expected, but not for years to come. To everyone’s surprise, and delight, the signal contained something curious. The early Universe, the data showed, appears to have been twice as cold as previously estimated, at minus 270 degrees Celsius (-454 degrees Fahrenheit), according to the study in Nature. Some suggested a role for dark matter — the theme of an accompanying science paper published by the same journal. The author of that study, Rennan Barkana of Tel Aviv University, said the freeze might be explained by ordinary matter interacting with, and losing energy to, dark matter. “If Barkana’s idea is confirmed then we’ve learnt something new and fundamental about the mysterious dark matter that makes up 85 percent of the matter in the Universe, providing the first glimpse of physics beyond the Standard Model,” said Bowman. Data from the Planck satellite showed in 2013 that ordinary matter — which makes up everything we can touch and see — comprises a mere 4.9 precent of the Universe, and dark matter 26.8 percent. The other 68.3 percent is dark energy. Invisible to telescopes, dark matter is perceived through its gravitational pull on other objects in the cosmos. But its existence is not explained by the Standard Model of physics — the mainstream theory of the fundamental particles that make up matter and the forces that govern them. Finding dark matter particles could require updating the Standard Model with futuristic theories such as “supersymmetry”, which postulates the existence of a heavier sibling for every particle in the Universe, or extra dimensions. Expert observers’ reactions ranged from “a truly amazing result”, and “wow!”, to advising caution. 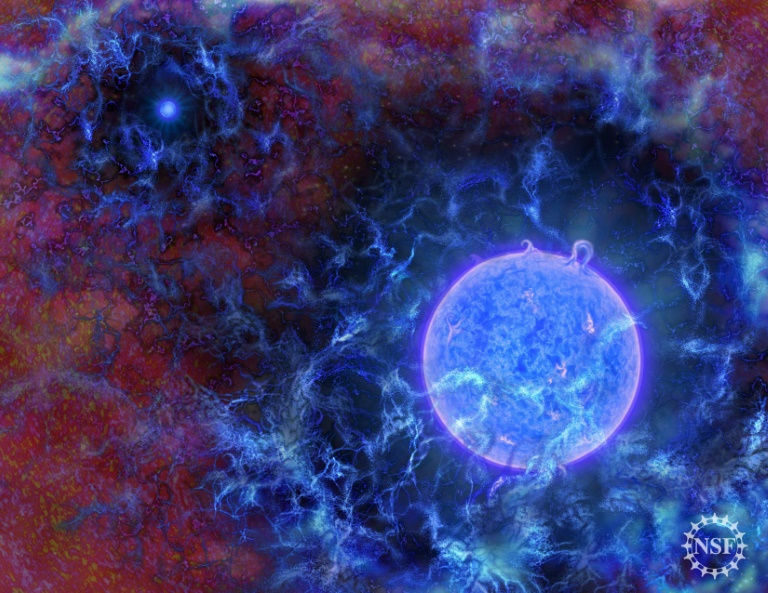 “The apparent detection of the signature of the first stars in the Universe will be a revolutionary discovery if it stands the tests of time,” said Nobel Prize-awarded astrophysicist Brian Schmidt of The Australian National University. “Astronomers worldwide will be holding their breath until the result is confirmed by an independent experiment,” added Karl Glazebrook of the Swinburne University of Technology in comments via the Science Media Centre in Australia. Described as technically robust by expert commentators, the findings must nevertheless be confirmed by independent experiments. Scientists believe that for about 400,000 years after the Big Bang, the Universe was dark — filled primarily with hydrogen. Gravity slowly pulled the densest regions of gas together to form stars, according to the Arizona State University’s School of Earth and Space Exploration. The signals detected in the study came from primordial hydrogen, at a time that light from the first stars made the gas detectible for the first time. Our own Sun and Solar System was formed about nine billion years later.